George Blankenship, the man behind the Apple store, is trying to give buying an expensive electric car same cachet as buying an iPad. Once upon a time, people didn’t camp outside the local Apple Store just to sneak a peek at a jumbo iPhone (we’re talking about you, iPad). But in the past decade since Apple opened its first store, the brand’s retail identity has grown to outsized proportions–and sales have followed. Now George Blankenship, Apple’s former retail guru, is trying to do the same thing for Tesla Motors. This week, Tesla unveiled its first Blankenship-designed showroom in San Jose, California (the company has 17 other locations, presumably less stylish, dealerships around the world). We can guarantee that it’s different than almost any other car dealership you’ve ever seen. Blankenship’s first hurdle to success is a pretty monumental one. Tesla only sells one car (the Roadster), and with a base price of $109,000, it’s not exactly a vehicle for the people. His solution: make the showroom look like an Apple store for cars. “It’s designed to be clean, approachable, comfortable and exciting,” Blankenship explains. 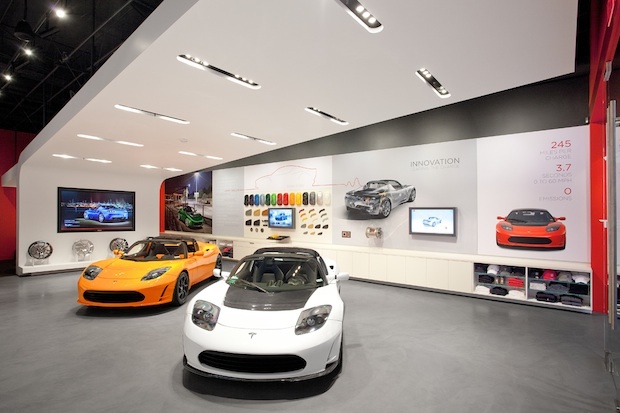 Even if you could only afford a Roadster by mortgaging your house, you’ll still want to check out the store; it has two enticing Roadsters in the middle, surrounded by jumbo touchscreens that allow users to digitally design and preview their future cars. Gawking at the vehicles is encouraged, particularly by kids who might harass their very wealthy parents into buying a Tesla. “We want every six year old who comes in the store to come into the car,” says Blankenship. That’s something you wouldn’t hear from the owner of a Porsche or Mercedes dealership. Unlike every other car dealership in existence, the Tesla showroom is on a high-trafficked street in an upscale shopping neighborhood. Neighboring shops include Gucci, Salvatore Ferregamo, and Tumi. So pedestrians passing by the store might actually have enough money to buy a Tesla. And since a large portion of the population doesn’t yet know what Tesla is, it makes sense for the startup to have a flashy showroom on a busy street instead of a sad dealership on the side of a highway. Test-drive vehicles are kept in a special Tesla parking facility behind the store. 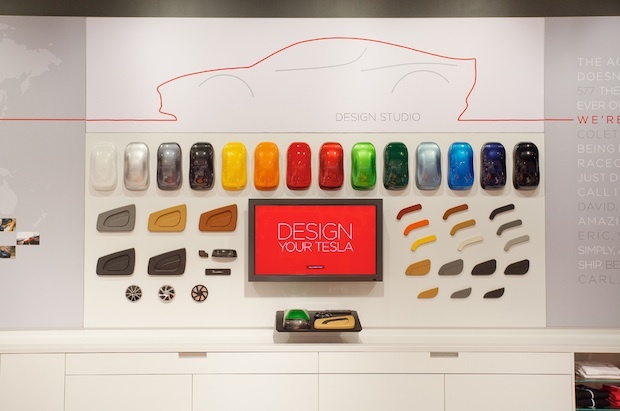 The store is designed to be easily updated, too; the walls are covered in fabric panels that can be switched out to display new images when Tesla unveils the Model S electric sedan next year (or on that far-off day when Tesla releases a third vehicle). That same flexibility will allow each new showroom to have its own identity. Will all of this transform Tesla into the Apple of the car world? Probably not. Tesla just doesn’t have enough models to show off, and the world isn’t ready to start snapping up electric vehicles like iPods and MacBooks. But one day, when Tesla releases cheap cars, we all drive electric vehicles, and the world lives in harmony, maybe everyone will do their car shopping in Blankenship-designed showrooms. Until then, we’ll settle for some eye candy.